The story opens with the funeral of Billy Lynch, an almost mythical character. During his life, Billy was well-loved; husband, friend, sensitive, gregarious, and ultimately tragic. Billy was a hopeless drunk who tried numerous times to get sober, but who, in the end, drank himself to death. In the shabby pub following his funeral, his loved ones gather to remember him, and talk turns, naturally, to “the Irish girl” whose untimely death forty years previous broke Billy’s heart and, it is assumed, led to his self-destructive alcoholism. In the summer of 1945, Billy and his best friend Dennis, fresh out of the army and waiting for their real lives to begin, meet Mary and Eva, two sisters visiting from Ireland and working as nannies for a rich family in the Hamptons. Billy falls hard for Eva. Their courtship is brief, for she must return to Ireland, but she does so with the promise that she will return to New York and marry Billy when he has saved enough to send for her. Desperate to have her back, Billy works two jobs and scrimps, saves, and borrows enough over the next year to send for Eva, only to receive word that Eva has died of pneumonia. Although he eventually marries the plain and loyal Maeve, Billy never recovers from Eva’s death, and turns to the bottle to console himself. Even more tragic, however, than Eva’s untimely death is the fact that she never really died. In truth, she accepted the money he sent to Ireland and used it to buy a gas station with the man she actually married. Unable to break the news of this terrible betrayal to Billy, his best friend Dennis tells him instead that Eva has died, thinking it kinder. Dennis, of course, lives with regret over this well-meaning lie, and many years later, Billy learns the truth. The story unfolds through the eyes of Dennis’s daughter – someone less than intimately involved with Billy, but aware of his story and able to make keen observations about the people and events that form the novel. McDermott’s writing is restrained, and the story is evocative and bleak. 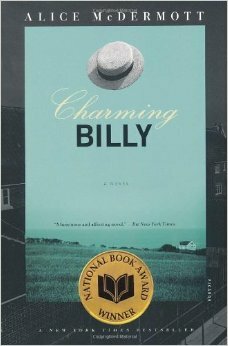 Anyone who has been intimate with alcoholism will likely recognize aspects of Billy. Ultimately, this is a sad story about the destructive forces of grief, addiction, and even loyalty. I must confess that I didn’t love this book, despite its National Book Award and critical acclaim. It’s one of those novels that exasperates me because I expect to be wowed by it and am left with only lukewarm feelings. It’s very well-written, and places, people, and events are masterfully depicted. I can’t really put my finger on what was missing for me; it very well may have just not been my cup of tea.